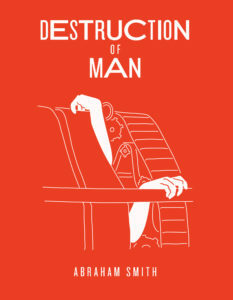 Abraham Smith’s book-length poem Destruction of Man hits like a driving downpour against a window pane, a wild drenching framed. The verse courses down the page in a single column whose width swells and thins, beginning as a trickle, now flushed to the margins, now dwindling to a word or two. Line breaks and the occasional extra space are the only punctuation here, capital letters appear only in chapter titles (and then with a vengeance), and a curious triple-slash either holds the paragraphs apart or stitches them together. when bites stop . . . The risk Smith takes by conjuring all this in one great diluvial surge is that his reader may drown in the noise. Once while reading I lost my bookmark, accidentally started back on a section I’d covered days before, and was excitedly underlining for pages before I reached an older pencil mark and saw my mistake. And yet, though bewildered, I was delighted to retread Smith’s oozing, shattered landscape, and so discovered that I could travel it in backward-hopping movements as well as forward-slithering ones. I thought of Gertrude Stein going around and around. I thought of e.e. cummings’ way of saying the thing again so that you might think he was finally saying it for the first time, of allowing several words to run together to confuse the beginnings and ends. There are poems that come to life only onstage, and others more comfortable on the page than read aloud, but Smith’s lyric translates fluently between the two modes. In a recent interview, when asked about the relationship between his written and performed poetry, Smith answered: “the performance and the page tip back and forth. i roar the poems – and the poems, unpunctuated, stream along i hope in a somewhat freshety style.” Smith reads with his entire body, which he moves like a shy and indecisive dancer, shuddering and shuffling his feet, dipping his head as though swimming up through something viscous. His voice trembles and he doesn’t pause at all, even to breathe — as though waiting in vain for the appearance of the next comma or period. His written word does its best impersonation of its feverish, embodied counterpart. Smith’s epigraph is another reminder that sound and performance are central to this work. It’s a video, embedded as a QR code, of the British modernist poet Basil Bunting reading from his autobiographical 1966 poem Briggflatts. Bunting is best known for his insistence on upholding the tradition of spoken poetry, influenced in part by the folk-songs of his native Northeast England. “Reading in silence,” he said, “is the source of half the misconceptions that have caused the public to distrust poetry.” What, for Smith, are the stakes of letting his words ring out? With a title like Destruction of Man, in any case, the entire species is advised to take note. do you not feel that you are drinking as a heron wd as you yrself gush the human aloe? Moth, hawk, horse, dog, snake, bear, octopus, turtle, crow: Destruction of Man is among other things a savage, tender bestiary, a teeming universe in which the human figures as only one among countless symbiotic vital actors. 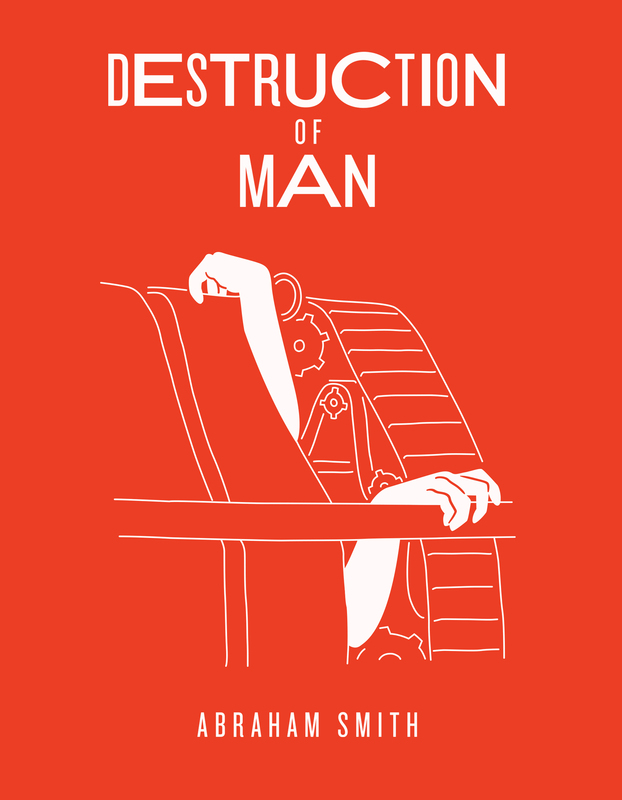 Is Smith’s destruction of man a metaphysical one too? More than as a blunt premonition of cataclysmic species-death, I read it as a posthumanist revision of the exalted category of Man. Elisabeth Fertig is a freelance writer, German to English translator, and PhD student in Comparative Literature at the University of Michigan. She also writes poetry and short fiction, and paints bad watercolors of trees and cats.